How can we be a beauty afloat with so much working against us? Who is this girl? You think she's a model? Does she know one end of a yacht from another? Sailing women, ... on the whole want to look good ... the sun and the sea can be very ageing and we need to adjust with no ready access to beauty salons, skin care products, and hairdresser. We might spend a lot of our time on a voyage with salt encrusted skin and hair. But do we really want to be grottie yachties? I always felt we needed to get rid of any men on board, hopefully while we were at a tranquil anchorage ........ and fly a flag with ‘Secret Women’s Business’ on it for hair colour, facials and waxing days. It’s not that we want to go all ‘shore glam’ for most the ‘au naturel’ suits the lifestyle and beauty afloat does bring forth the comments ... 'yeah right! “I always tried to keep standards on board as high as possible...... Was careful about keeping up personal hygiene too, and every day or second day I had a salt water bath, sometimes heating the water up on the stove to take the chill off it. Some yachts are equipped with showers and hot water with plenty of room to move; not mine. If you have a yacht with out the luxury of a shower you can improvise. I have two solar camping showers that I fill with water, one with salt water for wash, and fresh for rinse; I tie them on the deck with the black side up so the sun can heat the water, or boil some and add it to the cold water so its warm. Hang them from a fixture, boom or Biminis and depending on company; if you’re in a crowded bay or out at sea, how much of the bod' you bare. And of course there’s always the trusty bucket and a sponge down, beauty afloat ..... no excuses!! Walk barefoot along the beach …nature’s best pedicure. And when back on board moisturize your feet, trim and paint your toe nails, looks great in sandals. Fingernails are best kept short and unpolished as they break and tear with normal boat work, and polish chips and it’s not a good look. And the big issue when talking about beauty afloat is our skin! It is at the mercy of the elements for long periods of time. Salt water, sun and wind can accelerate the ageing process and turn skin to leather if we don’t take care of it! A real challenge to beauty afloat! What are some good natural ways of taking care of our skin? 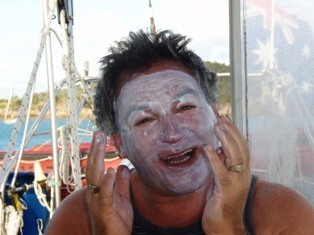 Trust a man to want to be my model in the 'not so beautiful look' with sunscreen!! But the message is there!! Slap it on!! Daily sunscreen and moisturizer with SPF 15 and SPF30 applied several times a day and definitely after a swim. If you like that sun kissed glow there are a big range of moisturizers which can give a gradual tan, not all have sun protection. And for an even textured skin on your face a lot of Foundation make- ups have SPF15 protection. And if you do end up with sunburn use an Aloe Vera gel. If there’s a small spot in the fridge keep it there, it feels great on a body that’s indulged in too much sun. To have short or long hair for sailing, especially on long blue water passages ... your choice! 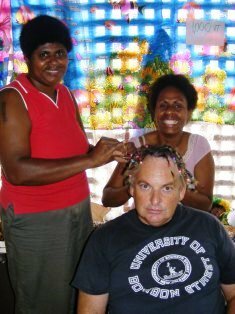 Getting hairdressers who can cut your hair the way you like it in foreign ports, ain’t easy! A fringe is easy to cut and wait till you are some where you feel comfortable. With long hair use a leave in conditioner and tie it back to keep it from tangles or getting caught in fittings while afloat. There are a lot of shampoos that work brilliantly with salt water. At a destination I will take some shampoo into the sea, lather up my hair and as much as possible of my body ... hang onto the ladder ...then dive under the water. My hair comes out soft and clean and feels like it’s been conditioned. Foundation … lipstick …mascara? While afloat or just for shore trips and socializing. Your choice! Keep in mind make up can melt especially in the tropics; a gooey blob of lipstick can really make a mess. If there is enough room put your favorite lipsticks and glosses in a small plastic container and put them in the fridge. Or if you have a fair bit of make up that could be heat affected a small lunch box esky/chilly bin will do the job. Women are sailing well past their 50's and 60's these days so its wise to take care of your self both in fitness and skin care! The best tonic of course is great health, an inner glow which goes along with stress free living and living the life of your dreams! In the Bay of Islands, New Zealand the VHF crackled into life; an invitation to a ‘Wild Women Spa’ aboard a neighboring yacht. A group of cruising ladies all with our own skin care products boarded a roomy boat; we were met with the smell of aromatherapy oils and soft music. It didn’t take long before some were getting split ends trimmed from long hair, relaxing and moisturizing face masks making us look like aliens, and a novice masseur gave shoulder massages. All this accompanied with countless glasses of wine and heaps of laughter, great sailing music, a whole lot of fun! No yacht? Get a bunch of girlfriends together and hire a yacht you'd have heaps of fun! I have tried the above on my own with meditation music and scented oils as I carry out ‘maintenance jobs’ … hair colours, face masks and nails … makes you feel fantastic. I am sure there’s heaps of other ideas for beauty afloat … and I am keen to get a ‘Women’s Secret Business’ flag made up so there are no interruptions. I was concerned that I’d give some poor visiting male sailor a heart attack if I appeared on deck with a green face mask on!! I’m a ‘clean freak!’ Hair ... body ... teeth and nails, being clean and looking healthy give’s you a boost and makes you feel renewed. Yes OK ... not really a beauty afloat but no excuses for being a ‘grotty yachtie’ like the lifestyle we choose we just adjust and improvise.